so my sweet friend crystal, asked me to try out her new templates. you know me, I kinda love crystal, and I kinda love everything she makes, so it really wasn’t hard to say yes. I used three different templates, from two different packs. what do I love about them? well, let’s just make it easier and list what I don’t love about them. this is from template pack #1, and perfect to showcase some of my favorite pix from our recent lagoon trip. I love the white background, but also the option the template gives to change that up whichever way I choose. I love to have the pop of color on the very background, but still have the clean feel of the white behind my pictures. I used pebbles “seen & noted” paper and elements to tie this all together. and that stitching.. perfect to pin down all of those little tid-bits. crystal has made this so super easy, with all the shadows and overlays, even the stitching pre-set (but with the option to turn those layers off if you are not in the mood). I love this picture, and decided that while it will definitely hold a spot in my weekly project life layout, it deserves a page of it’s own.. I used a template from template pack #4 and “chasing rainbows” paper and elements from dani mogstad. perfect to express that feel of blissful childhood I so totally see in this picture. this was easily one of the happiest days of our summer so far..
my sister-in-law came home from her 18 month mission to nashville, tennessee!! I used another template from template pack #4 (guess you could say it’s my favorite pack? maybe?..) and LDS missionary sister edition from becky higgins project life designed by kimberly church. I am so completely happy with how easy (and quick!!) these were to use. now if you have been scrolling through, checking out what these babies have to offer, maybe even clicking on the links, following them to the stores where you can purchase them from, well, I have some completely awesome news for you..
she is offering a 50% off coupon to purchase her templates here. just enter the code CWTEMP50 at checkout before june 22nd. want more eye candy? 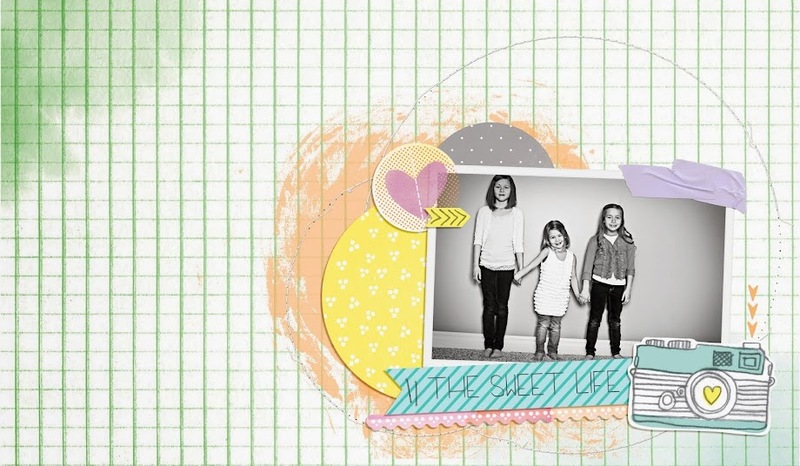 check out her blog and what she did with a layout a day with these awesome templates. so with my choice to be happy, no matter what, I haven’t found it coincidental that there are so many things that just kind of happen, that remind me of what I am choosing out of life these days. as I sat down to work (play) with the project life release from stampin’ up!, I saw no coincidence with all the happy things I was seeing..
as I end my days, I reflect on the happy. I realize that not every day is entirely happy or perfect, and sure, as I journal, I note the things that are troubling. I don’t go into great detail about them, I don’t want that to be my focus. I seek out the happy, no matter how small. my favorite is to look through the pictures I have managed to capture.. it’s happiness frozen. I look ahead at what’s to come, not really “loving” all of it, but still, loving what I can about the now. school will be out this week. I am trying to not look past that right now.. if I look beyond, that means another year of school. lynn one step closer to junior high. ashley getting that much more smart-assey, and peyton gone. all. day. long. but I will take it one week at a time.. I am thankful that my goal to do project life helps me to focus, reflect, and to embrace all of the happy. and wouldn’t you know, this week’s digital project life release is called “happy”. here’s to another happy day. last week was a good week in pictures. I mean, you can have good hair days, I even declare some days good handwriting days, so why not a good picture day? I decided to document one of my favorites in a layout, all for that one pic. it will probably make an appearance in the weekly project life layout too, but it was just so good, I decided that two showings for it would be just fine. and the most awesome thing is that this ^^^ isn’t the only beautiful thing about life lately! I have had so much energy, so much motivation, my list of things to-do is longer than I have time to accomplish. I know (I KNOW) that my little corner of the world (at least my perception of it) has so vastly improved because of prayer. prayers of family, loved ones, caring friends, and my own. I wish I had recorded ashley’s facial expression when I told her she would be in the same room as the prophet. think = priceless. the only thing that could have possibly made that night better would have been if peyton were 8 and able to attend with us. we also had conference weekend. there were great things that weekend, as there always are. again, I tell you, president eyring spoke right. to. me. I am working on my studio and being just as ocd as ever about ever last detail. even though we didn’t get much snow this year, it was still winter at the pitcher house. 1) I had the uncontrollable itch to re-arrange, re-decorate, and just shake things up in general around the house. we moved the two youngest upstairs in the loft area, moved their tv room downstairs, and my studio from the basement up to peyton’s old room on the main level. the hopes are that now, every little girl in the house will sleep through the night (I know, 11, 9, and 6.. they got on a fear kick in october, and it still isn’t over), and the other hope is that I will get some of my fun stuff done. it’s not fun going down to the basement alone. where no one else is. to work. where it was not motivating. we were also tv starts for a second on a local show, studio 5.
we enjoyed too much sweet stuff on superbowl sunday (but seriously, that is what the superbowl is all about..). took a trip to the natural history museum of utah, which was AWESOME and totally AMAZING, and WE WILL be going back. there was so much incredible stuff to see, and we didn’t even get close to seeing it all. the last little bit is a homework sheet from peyton’s homework packet. I LOVE the phonetic spelling.. her favorite season: summer. things you wear in summer: “swimsoot”. I LOVE this! and 2) three pictures from this particular week have to do with different people being ill.
the ONLY thing I hate (absolutely HATE!!!) about winter. lynn participated in her first science fair. we tested gum. our jaws are still recovering. took ash to the doctor for what I suspected was strep. it was just a virus (which = a wasted co-pay). took peyton in to the instacare the next day, for the flu. wick girls = drama + emotion. this was a quiet moment. got some sweet thank you gifts from teresa hunsaker for the studio 5 segment. she is SUCH a SWEETHEART!! this is peyton’s fever.. back again. took lynn to the 5th grade maturation program and traditional ice cream and “ask me anything you want” afterward. my intentions were good. oh soooo good!! I started out strong, just not strong enough. now I am living with the decisions I made, and trying to catch up! I set out to do project life, and got some pretty awesome tips to “help” me. some of them ended-up giving me excuses, and thousands of ideas as to why I should just start all over, but I am not. I am sticking to it. I will get there, slowly but surely. - pick a template, maybe two, but the fewer the better. - pick a kit and try to stick to it. there were fun cards and embellishments from my stash that i was able to use to mix it up a bit, but for the most part, too many choices just complicate things for me, and project life is not supposed to be complicated. i actually created a folder on my computer, and titled it "my project life" and copied the supplies i wanted to use continually throughout the album. for the most part, my background paper and fonts stayed the same. so did my template. i also edited my pictures the exact same way every time. - calendar in a day when you project life it. have that time consistent so it gets done. - i keep a journal on my phone with the day one app. every day i write about the events of the day, that helps when i go to journal. - be flexible. i missed a few weeks, and that was hard to go back and fill in the gaps. when life just got too busy, i stopped. i still have catching up to do, and if i just started out being flexible with myself, i wouldn't be there. i also picked one way to start the album, one basic style to stick to, and i just wasn't loving it anymore come march. when you don't love what you are working with, you should be flexible to change it up. i wanted to keep the album cohesive, but i should have allowed myself to be more flexible so i would have stayed excited and in love with the process. - involve your kids!! that is part of the plan for me this year. let them journal about the day or a certain event. after watching the rebroadcast of project life on creative live, i have so much motivation and new ideas to help keep this ongoing. scanning in kids art and school work is something that i want to implement. - accountability. i have let my blog go, i don't post in galleries like i used to, and if i did, there would be some accountability. i wouldn't get behind. I have a few weeks completed from last year, I still have A LOT of catching up to do, but it isn’t hard. two things that saved me: my photo 365 app and my day one journaling app. those were two things I was very consistent about, and now I have both of them to fall back on to fill in the many gaps of 2013.
it’s been about, 5, almost six months? i will try to explain. try. life kind of came apart back in august. I lived for the end of the summer, tried to fill it with fun and perfect everything for my girls, tried me hardest to make every last minute worth it, for me and for them. with the girls going back to school, I was plenty emotional. like, that is an understatement. I cannot recall a year that was harder on me. I mean, it’s always hard, and I always miss them, but this first day, I cried more than I think I ever did. and it didn’t get any easier the next week when this one went to kindergarten. along with these already anticipated blows, came another unanticipated blow. my husband decided that he was done with church. and I decided to keep it a secret until december. awesome christmas gift, am I right? I really shouldn’t say that it was unanticipated, because, as I look back on it all (you know, because hindsight is always 20/20 and so forth), there were indications, I was just living in denial. it was either denial or an incredible state of hope. I swore I would never do that as long as I had kids at home, but circumstances being as they were, I desired a) something to fill my time while peyton was gone for half of the day. and 2) I still wanted to be able to receive the blessings of tithing. I need them. so as life was as it was, I lost all steam to do those things that make me, me. I stopped doing so many of the things that I thoroughly enjoyed, because I was so sad. I felt hopeless. I felt like everything that I had worked for for the majority of my life was falling apart, it wasn’t perfect, and I didn’t want to put this broken mess out there for the world. not for attention, not for pity, I just didn’t have the energy or the desire. and as I look back on it all, I can recognize a very depressed girl. I am trying to turn that around. I am taking time for myself, trying to make time, and desire, to do the things I have always enjoyed. don’t get me wrong, those voids were filled with some very good things too. as a side effect of my husband’s choice: my testimony is pretty dang awesome. it is going through this fortification process that is amazing. it is awesome to see how my heavenly father is blessing me in every moment. I have friends, some I have never met in real life, who encourage me. they have NO IDEA what I am going through, but they are there (bugging me to get back at it.. ahem.. missy). I have friends from my past, just show up at just the right time, able to say just what I need to hear, not having a clue the blessing they are to me. I really didn’t intend for this to be a tell-all of the drama in the pitcher house. I just needed to do it, and stop putting it off. I have a whole list in my head, all the reasons to wait. take new pictures of the girls.. make a new header.. get a few more project life layouts done. try to think of anything more to say than the despair and sadness I feel so often…. trying to hold back tears..
babies grow, people die, time passes waaay too fast, and as women, we have hormones. my hormones are at this very moment on the emotional up-swing. it’s fabulous. so while I created these layouts earlier in the week, when my hormones were doing other things to my body, as I look at them now, I want to cry!!! first up is “grandpa’s chair” using goodies from liv, including her newest, brownbagger paper pack vol. 5. I could NEVER get enough of her brownbagger papers… NEVER. this second one is only four years old (ppffttt…), but this is what digital project life is so good for!! catching up in a fast, easy, gorgeous way! this layout I used becky’s “p” template (perfect for little peyton..), “honey” edition cards, “baby” paper, stitching from anna aspnes, staples from liv, and that fun baker’s twine from splendid fiins. okay.. so I am not going to look at these for at least another week, try to block out the fact that school will be starting again this month (aaaakkkk!!!! ), and just try to do things that are fun, non-tear inducing. did I mention that it’s really the hormones fault?